What’s the story behind the Clonakilty brand? 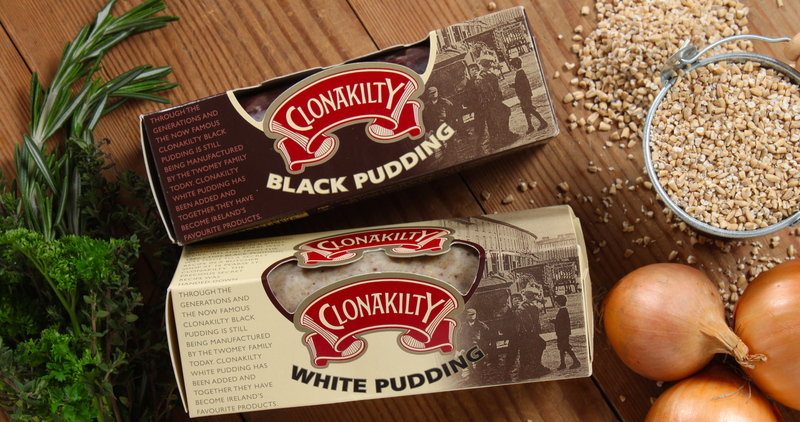 Clonakilty Black Pudding was first made in Edward Twomey’s butcher shop in Clonakilty, West Cork, Ireland in the 1880s. Today it is still made using the same secret spice blend which has been handed down through generations. All Clonakilty products are made using traditional methods, with recipes created from the knowledge and craft gathered over a century of Black Pudding making. Tell us an interesting fact about the brand or one of your products. Many black puddings are made with pork, but Clonakilty Black pudding is made using premium Irish beef along with oatmeal, onions, beef blood and a secret blend of natural spices. Our White pudding is made with premium Irish pork, oatmeal, onions and a blend of spices, and does not contain any blood. Clonakilty is Ireland’s favourite black pudding, and from your Facebook Page it looks like you have fans as far away as Australia! What makes it so popular? We pride ourselves in quality, wholesome ingredients and unique taste. Success in the Irish market is due in no small way to the passion of the Twomey family and their dedication to delivering quality gourmet products. While Black pudding is traditionally served as part of a breakfast, Clonakilty Black pudding was championed by many famous chefs and used as part of a starter or main course. That really helped to solidify Clonakilty as the number one Black and White pudding and the number two sausage brand in the market. It was due to the success in the Irish market, and the demand from Irish consumers in foreign countries, that Clonakilty began developing an international marketing strategy. We began exporting to the UK and Europe and recently set up production in Australia. We’re intrigued to hear about other ways to use black pudding – what recipes would you suggest? Oh, we have a grand recipe for our Black Pudding, Roast Beetroot and Goat’s Cheese Tart, which is fantastic served hot for lunch. How many Clonakilty puddings are sold each year? Last year, we produced over 4,000,000 puddings; the figure has been steadily growing over recent years. Wow that’s a lot of puddings! Your bacon is delicious, what’s your recipe for a perfect bacon butty? Why thank you! When it comes to bacon butties we like to keep it simple. All you need is sliced white bread, toasted, spread on a bit of Ballymaloe country relish, add few slices of crisp Clonakilty Dry Cure bacon then wash it all down with the obligatory cup of Barry’s Tea. Bacon butty bliss! This entry was posted in Talking Ocado and tagged a taste of home, Bacon, bacon butty, ballymaloe, Barry's Tea, black pudding, Clonakilty, Cork, craft, Groceries at Ocado, homecooking, Irish food, Irish groceries, Irish produce, Irish recipe, Recipes, Recipes at Ocado, sausages, Shopping at Ocado, skill, Traditional, white pudding by Naomi. Bookmark the permalink. Do you export to Italy your blackpuddings and if so what part. I have recently opened a restaurant in Rome and specialise in artisan burgers. Am interested in the blackpuddings as my mother is from Cork and I myself really enjoy them when i return to Ireland. Can you give me some information on the above. Hi Laura, we’re really sorry but sadly we do not delivery or export to Italy. We currently only deliver to mainland UK and do not have future plans to deliver in Italy in the near future. We’re very sorry for that but hope you’re able to get your hands on some black pudding soon!